The NHRA cancelled today as expected from the previous forecast updates. The beginning of the morning was pretty good, however it quickly got worse a onshore flow ahead of the front promoted upslope activity. This activity moved over during the afternoon and officials called the race off. It is expected to resume at 10am on MOnday morning. It will not air until Monday night on Fox Sports Network 1 and will not be live. FS1 seems to think other shows flapping their jaws like soap operas is better than airing a live drag race. To each their own. If you are heading there on Monday then expect excellent weather. As for overnight tonight. 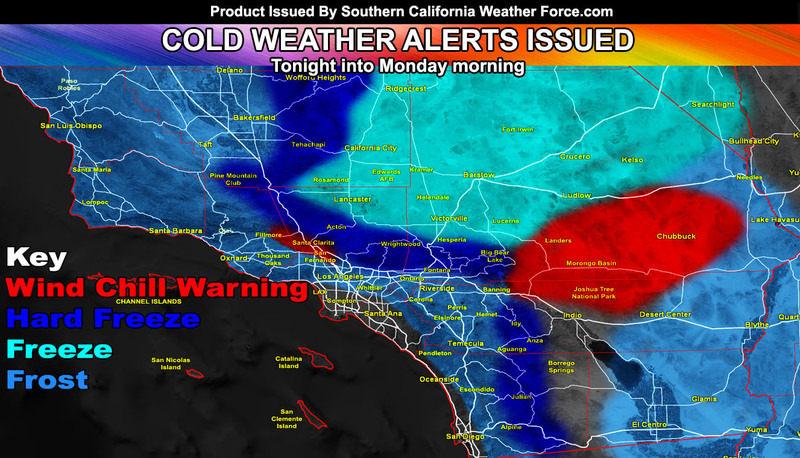 I have issued a Wind Chill Warning for the Santa Clarita and San Fernando Valley, including the Morongo Basin. The wind gusts through the night will be in the I-15 corridor down into the SCV/SFV areas. With 32 degrees showing up in the SCWF low temperature model, this will work with the winds to lower the wind chill into the 20s in both the SCV/SFV and the Morongo Basin surrounding Joshua Tree/29 Palms along HIghway 62. Take your cold weather precautions now, including care of plants and animals. For the rest of the forecast area, pay attention to your cold weather alert and zones. A cold front is swinging through the area this evening and will move out by tonight. The dry-air behind the front will bring a dramatic drop in temperatures across most of the forecast area, the exception being the LAX/Central LA Basin and Downtown San Diego Proper zones where temperatures should be near 40.. still cold.. not frost advisory criteria. The following areas are in warnings/advisories here at SCWF; Mountain areas are not in warnings because you know it is always a hard freeze there with these. I will be taking a short break tonight into some of tomorrow and will report back on the mid-week rainfall by Monday evening. MICRO-CLIMATE ALERTS ARE ISSUED to PREMIUM MEMBERS via EMAIL. However, you CAN get them on FB if you set the notification to see ALL posts in a group. Join as many in your region as possible so you have the best chance of seeing ANY future updated alerts.